You might think of your dental providers' practice as completely independent. Your dentist isn’t connected to a hospital and performs common procedures right in the office. It is only when you require more complicated work that it will become apparent that your dentist is the most visible member of a larger team, a group made up of other professionals such as oral surgeons, as well as outside lab facilities. A dental lab is a stand-alone facility whose only business is to partner with dental professionals to provide the specific, customized appliances that patients need. Dental labs produce products such as retainers, braces, crowns, bridges and dentures. Although it is your dentist who carefully takes the impressions of your tooth, it is the lab which uses state-of-the-art visualization techniques to fashion the casing which will fit snugly and precisely over your tooth, restoring its strength and usability. The technicians who make your crown have been specially trained in using the latest precision equipment to ensure that it is well-made, strong, and long-lasting. Each set of dentures or partials must be unique to the patient, and it is vital that they fit perfectly. Otherwise, chewing will be painful, discomfort will result, and the dentures may even cause infection or gum damage. 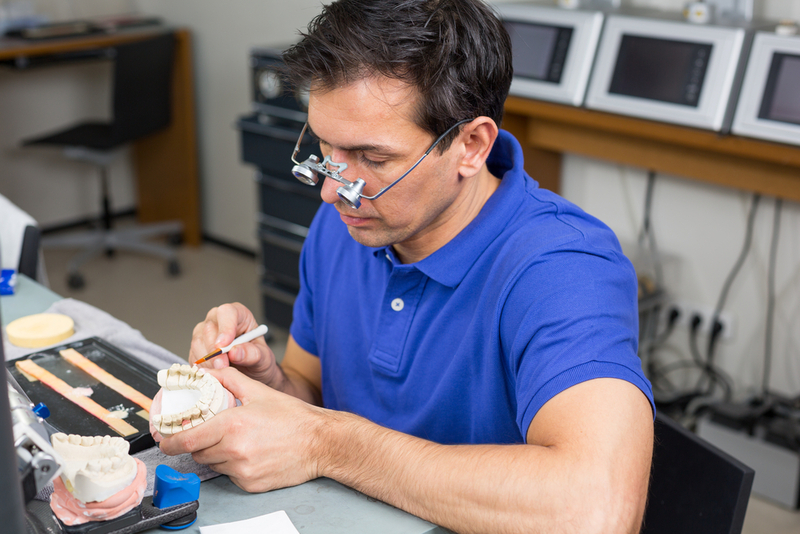 Skilled technicians in dental labs systematically review each detail of the patient’s jaw, mouth and gum structure to ensure that the dentures will be comfortable for many years to come. As vital as dental labs’ role in your dentist’s practice may be, one of the reasons few patients think much about them is that they usually do not receive a separate bill for laboratory services. Instead, the vast majority of dentists include the lab fees in the bill for procedures, even so-called cheap dentists. What these labs charge varies greatly depending on the procedure, the intricacy of the work, the time it requires, and the materials used. Factors such as the fluctuating price of certain metals also make it difficult to determine ahead of time how much a lab may charge for a specific procedure. Yet, there are certain approximate figures that patients often find helpful. Even if you see a so-called cheap dentist, if you do not have affordable dental coverage, these costs will rarely be much lower than the above figures, since they include what the outside laboratories charge. Given the high prices for crowns, dentures and other oral treatments, many patients look to insurance and other outside sources for help instead of trying in vain to find a cheap dentist. In these troubled times, few of us can afford these staggering expenses strictly out of pocket. If you have traditional insurance, it may cover a certain portion of the expenses as long as you have paid your deductible and have not exceeded your yearly maximum. You might also be subject to a lengthy waiting period before you can get the dental work done. Another option that can help you with your overall treatment costs is a discount plan such as the Careington 500 Series plan. With no deductibles or annual maximums, this plan can offer the dental restorative procedures such as crowns and dentures at a mere fraction of the full price. To show you just how dramatic these savings can be, look back at the example of the $1006 porcelain crown. That same crown, when purchased through the Careington 500 Series plan, could only cost in the $500-700 range in many areas. In today’s fast-moving, high tech world, things are rarely as simple as they first appear. Whether you have a cheap dentist or not, he or she is not operating in a vacuum. Dental laboratories furnish a vital link in the provision of excellent care to patients like you, and they do so at a cost that is sometimes hefty. As you look at the options at your disposal to help you pay for your dentistry, be sure to consider a discount dental plan to cut down the cost of crowns and dentures made at a lab.